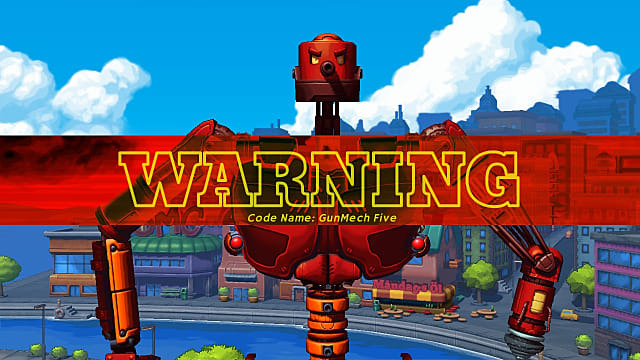 Bertil Horberg and Horberg Productions are known for the Gunman Clive games, quirky platformers set in the Wild West. Horberg Productions’ latest game, Mechstermination Force, shatters that mold completely. 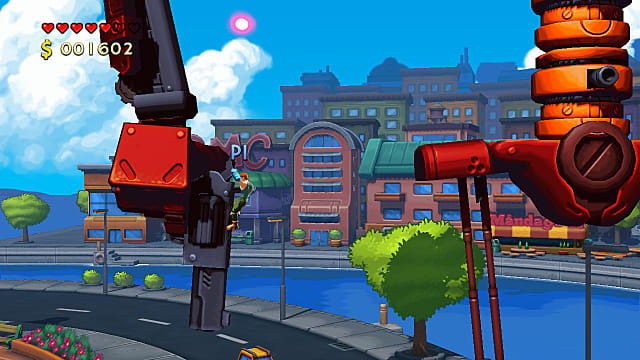 Despite being set in the same universe as Clive, Mechstermination Force utilizes completely different mechanics and setting. In every sense of the phrase, it’s a boss rush set in a post-robot-apocalypse world. At its core, the game is based on a solid foundation, and the combat is wild and fun. However, it’s all bogged down by some questionable design choices and mechanics that work against the player as well as the game’s own design. There isn’t a whole lot to say about Mechstermination Force‘s plot. That’s because it’s only meant to serve as a backdrop for the action. Late in the 2000s, giant mechs attacked the world’s major cities, including Paris and Washington D.C., simultaneously wiping out the centers of power and threatening all of humanity. The world’s only savior is a small band of warriors. Only, most of them don’t do much, so the world’s only savior is basically you. However, that’s about it as far as narrative goes. You’ll get some extra bits of information through random dialogue with your fellow force members in between battles, things like how the energy cores in the mechs could save the world. But the emphasis is firmly placed on the action. There are more than a dozen bosses to challenge, and after the first couple of fights, you can choose between three different challenges; there’s no set order to tackle them in. Progress and in-game rewards or events don’t change regardless of the order you choose. 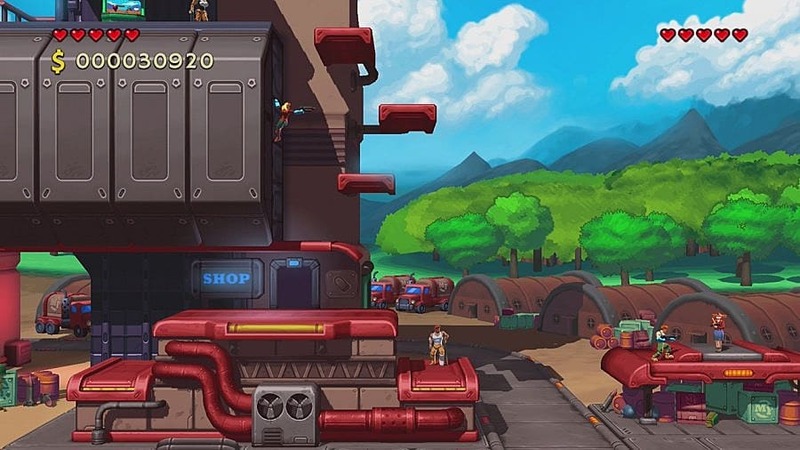 It’s a Mega Man-type setup, without the Mega Man rewards, since it seems like the only reason to choose a different boss is if you’ve reached your tolerance limit with one and need a break. The idea behind these bosses was taken partly from the original Shadow of the Colossus. The vast majority of weak points on each giant ‘bot is somewhere out of reach — under the head, in a little nodule in the center, and other, similar tucked-away places. The red cores are the main target, and they can only be damaged with your melee weapon. These vary in size and can take anywhere from one hit to three or more, depending on how large they are. In many cases, destroying one will open up the path to another or forcibly eject you from the mech’s body so you have to repeat the process. 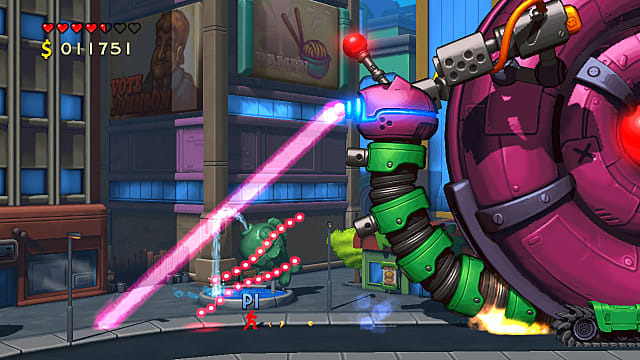 The yellow areas damage the mech in some way, sometimes making bits of it fall off or cutting off its capacity to attack in a certain way. Even though the NPCs don’t give them as much attention, you still have to destroy all of the yellow cores on some mechs in order to finish them off. 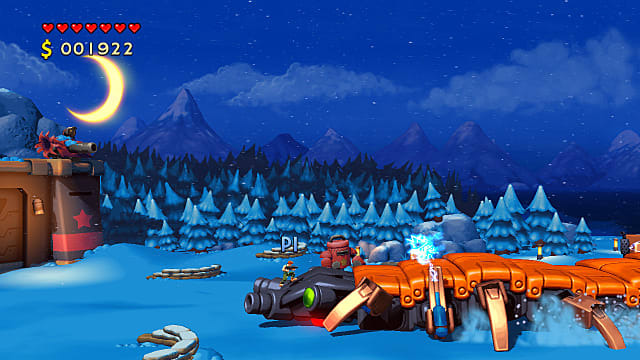 Most of the mechs require varying levels of platforming to reach their weak points, making Mechstermination Force‘s similarities to games like Contra easy to see and feel. It also means there’s a lot to pay attention to in each fight if you want to stay alive. Each boss is cleverly created as well. Some are obvious callouts to Horberg’s Gunman Clive games. Others, like Mechbeth, combine a mix of off-the-wall design with fluid, well-planned progression that makes completing the fight feel natural and very satisfying. The ranks go from no stars (worst, of course) to three stars, and naturally, the rewards are lower for the lower ranks. Unfortunately, there’s no way to tell what time you need to clear to get which rank, nor is there a visible timer to clue you in on whether you should restart and try again or keep going. You get the option to replay boss fights for more cash and to earn a higher rank, but the cash reward is fairly low. Upgrades, including health upgrades, are expensive. You’d need to clear two or three main fights or multiple replays to earn one weapon upgrade. It’s a shame because these upgrades make it more likely that you’ll earn a higher rank in the main battles too, so it’s a somewhat self-defeating cycle. That impression is made clearer by the boss’s attack patterns, though. 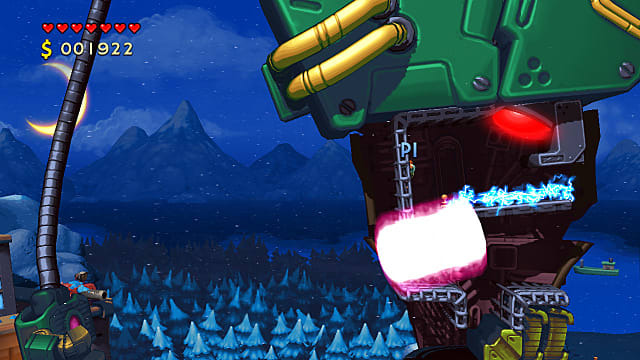 Some, such as the second boss and the one pictured on the game’s logo art, go randomly go through a series of attacks. However, a weakness is only exposed through one of those attack patterns, and it can take three or more repeats to finally get to the series you need. If you’re grinding for better ranks, it’s very frustrating, indeed, to have higher ranks and more cash blocked off from you because of the enemy design instead of your own skill. Clearing the game with no upgrades is certainly doable, but if you want to unlock everything or give yourself more of a fighting chance, it’s going to take a mix of luck, skill, and lots of replays. It isn’t a problem for all of the bosses, but it is for enough of them to make replaying more of an issue than it should be. That’s doubly true when you consider Mechstermination Force was created in part with speedrunners in mind. There are some other drawbacks as well. 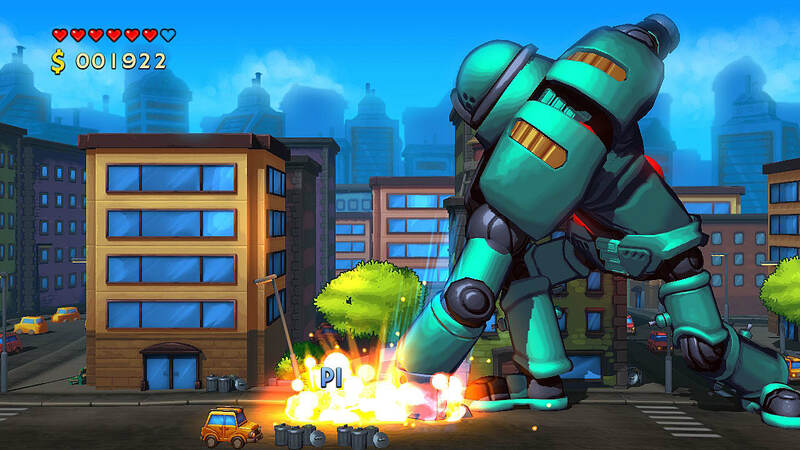 Mechstermination Force is a difficult game, and that’s not a bad thing. There’s a feeling of accomplishment that comes from mastering a boss’s attack patterns and learning how to deal with the challenges it chucks at you. However, at times, there’s too much going on at once, making it impossible to avoid taking damage. After destroying a red core for some bosses, you’re sometimes chucked back across the screen into other hazards still at play, and you can’t actually dodge them. It’d be easy to say that’s part of the plan, forcing you to think on your feet and make the best of a bad situation. But there shouldn’t be a situation where you can’t overcome a challenge on purpose, particularly when it just means you have less health to take on a boss’s second or third forms and end up having to replay the entire thing again. And again. Normally, you would see a red ball of energy coming at you and think touching it would hurt you somehow. That isn’t always the case in Mechstermination Force. It seems like the center of an object has to touch you to cause damage, and it’s even more visible with larger projectiles like MechaMan X3’s energy shockwave. You can get hit by the beginning, top, and end of the wave and not take damage. It’s almost second nature to time a jump so you avoid an incoming obstacle. However, when you have to try and guess that timing because of funky object programming, it both makes you more likely to end up hitting something else coming your way and takes you out of the experience. The platforming feels off at times, too, especially where the magnet gloves come in. There were plenty of times when jumps had to be repeated again and again because the magnet gloves didn’t connect to the metal surface for some reason. When they did connect, the difference in space between where the character was at first and where he was when it finally worked was seemingly infinitesimal. You need to jump over that ledge to reach the next metal part for the magnet gloves to connect. Jumping up doesn’t give the right momentum, and left just makes you fall. There are a few times when the robot’s movements make it easier to complete the action, but like with the random sequences mentioned earlier, it’s random when it happens. Another involves the chimp-bot, better known as Mechstructor ZC. You have to jump up its extended arm to reach the red core, but there’s a very, very specific window of opportunity for it. Jump a millisecond too late, and the monkey punches you across the screen, even when your feet have cleared the hand. Under normal circumstances, these wouldn’t be issues that warranted too much attention. But these boss fights are the entire game; there’s nothing to distract from the problems. There’s no denying Mechstermination Force looks good, though. It utilizes a rich cel-shaded style that makes each aspect of the mechs and environments stand out, even the more generic environments like the snowy base ones. The soundtrack is serviceable, but not really noticeable. There are two main ways you’ll likely experience it: ignoring it because you’re absorbed in a fight or turning it down because you’re tired of hearing it for the 25th time you challenge a boss. Mechsterimniation Force works well when it does work. And make no mistake: there’s a definite audience for it. 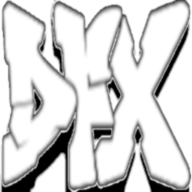 However, the platforming quirks, contradictory relationship between timed battles and random attack patterns, and playing the same fights again and again (and again) make it a difficult game to easily recommend.